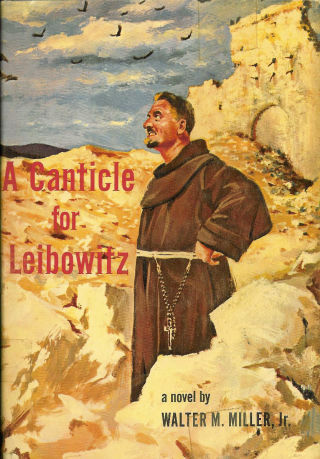 Jon Michaud in The New Yorker is offering up an insightful look at Walter Miller’s A Canticle for Leibowitz. In addition to name-checking some of the Usual Suspects (Orwell’s 1984, Bradbury’s Martian Chronicles, Wells’s War of the Worlds), he also places Miller’s work in context with current examples of apocalyptic literature, such as Colson Whitehead’s Zone One, Eden Lupecki’s California, and Emily St. John Mandel’s Station 11 (currently a National Book Award nominee). Michaud also examines how Miller’s wartime experience as a bomber radio operator participating in the aerial attacks on Monte Cassino in Italy, the founding house of St. Benedict, who established the rules of Western monasticism, helped create the image of St. Leibowitz and the preservation of Western civilization after an atomic holocaust. Michaud links Miler with Kurt Vonnegut (Slaughterhouse Five) and Joe Haldeman (The Forever War) as authors who reshaped their wartime traumas, via humor, into commentary on the repeated if regrettable human tendency for self-destruction. A piece well worth reading, if only for the mention of Junot Diaz publishing an alien invasion/virus outbreak story in The New Yorker.